At Nutricia, we work hard to ensure patients receive the best nutritional support. 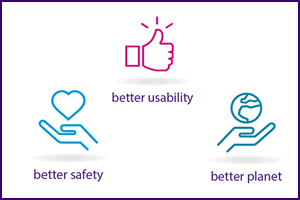 We’re committed to continuously improving our products for better usability, better safety, and to be better for the planet. That is why our enteral pack feed products have started undergoing a packaging transformation in to the OpTri bottle. To create the best possible bottle, we first sought advice from the people that would use it most. 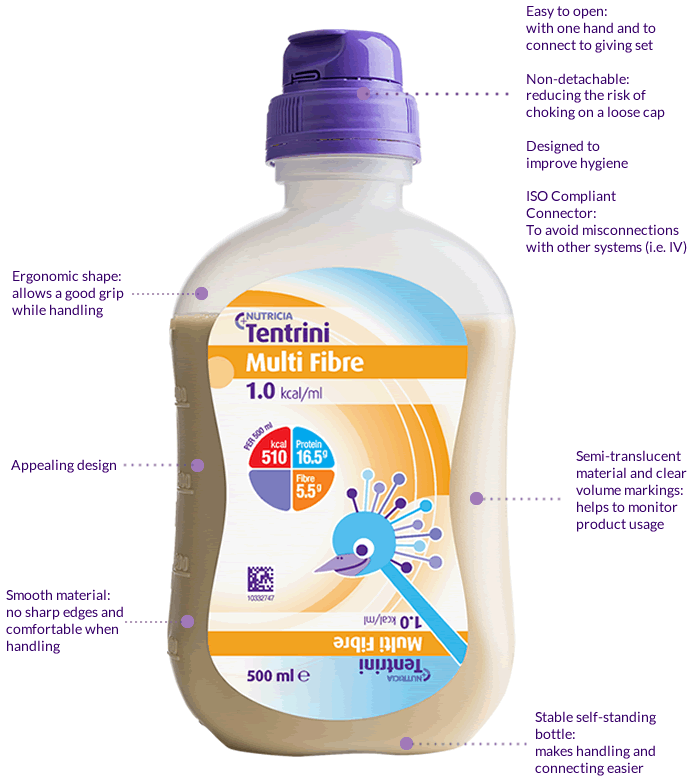 The OpTri bottle has been designed to make feeding easier for patients and carers, HCPs and facilities. It’s user friendly, more hygienic and made using reclaimable and recyclable material. The Nutrini, Tentrini and Nutrison ranges are a Food for Special Medical Purposes and should be used under medical supervision. The instructions provided below should be used for information purposes only for patients, carers and HCPs. Take a seated or semi-seated position during tube feeding, and at least half an hour after tube feeding – this facilitates the passing of the feed through the stomach. Remove the feeding set from the packaging. Remove the cap from the end of the feeding set. NB: Make sure not to touch the cross shaped connector underneath as this could cause contamination. Flip the bottle cap open. NB: Be careful not to touch the port underneath as this can cause contamination. Place the bottle in the upright position, attach the feeding set to the bottle. The feeding set has a plus shaped connector (+) that needs to be aligned with the plus shaped cross port (+) on the bottle. It’s important to push down once the feeding set has been attached as this will pierce the integrity seal underneath the cross port. Once you have pushed down, screw the feeding set to the bottle until firm/tight. Once connected proceed as normal with your feeding regime. Place the bottle in the upright position and twist off the whole flip-top cap. Open the feed by pulling the aluminium off. Draw up the required amount of feed and follow normal feeding regime. Optional: the feed can also be decanted according to patient need. Once the bottle is open, reseal and store in a refrigerator for a maximum of 24 hours. Refer to the product label for more information. Does the feed formula change with the introduction of the OpTri bottle? No, only the packaging will change. All formulas and nutritional values will remain the same as they are currently. Will the NutriniMax range undergo a name change? Yes, the NutriniMax range will become Tentrini with the introduction of the OpTri bottle. Will any other tube feed products have a name change? No. Only the NutriniMax range will have a name change to Tentrini. The label looks different on the OpTri bottle. Yes, we have made improvements to the label to avoid any unnecessary confusion. The new label is a re-closable booklet, has a reduced amount of languages included, and is now colour differentiated to help with selection in a clinical setting. Can a Flocare Infinity Pack Set be used with the OpTri bottle? 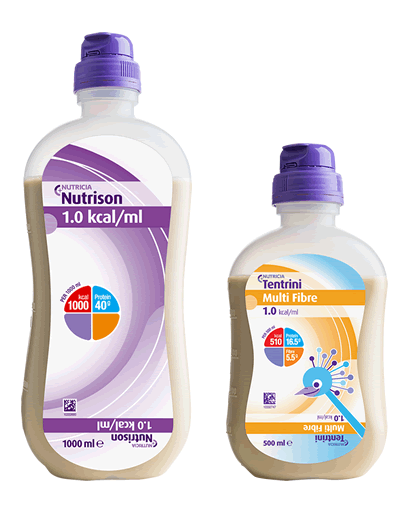 Yes, all OpTri bottle feeds are compatible with all existing Nutricia pack sets. NB: Please consult your healthcare professional to ensure suitability of feeding set. Can a Flocare Infinity Bottle Set be used with the OpTri bottle? Yes, all OpTri bottle feeds are compatible with all existing Nutricia bottle sets as an open system. Can a Flocare Infinity Gravity Set be used with the OpTri bottle? Yes, all OpTri bottle feeds are compatible with all existing Nutricia gravity sets. Is the OpTri bottle recyclable? Yes, the OpTri bottle is fully recyclable. When will all pack feeds have transitioned to the OpTri bottle? To ensure a smooth process and avoid any disruptions to patient regimens, the packaging transition will be gradual – commencing with the 500ml feeds in late 2018. The process will continue in to 2019, with all pack feeds expected to be changed over to the OpTri bottle in 2020. Can the OpTri bottle be used as an open or closed system? The OpTri bottle offers both alternatives. NB: Please consult your healthcare professional to ensure suitability of feed delivery. Is a bolus adaptor required to decant feed when used as an open system? No, the cap can be removed in order to decant feed without the need for a bolus adaptor, however, bolus adaptor can still be used if preferred. How should the OpTri bottle feed be stored once opened? Once opened (foil pierced and feeding set removed), close the bottle and store in a refrigerator for a maximum of 24 hours. What is the hanging time for the OpTri bottle? When used as a closed system (aseptically handled and attached to feeding set), the OpTri bottle has a maximum hanging time of 24 hours. When used as an open system (the screw cap and foil seal has been removed), the OpTri bottle has a maximum hanging time of 8 hours. How should the volume marker on the side of the bottle be used? The volume markings on the side of the bottle are to be used as a guide only. Is the OpTri bottle fully compatible with all Nutricia medical devices and accessories? Yes, the OpTri bottle cap contains an ENPlus cross port which is fully compatible with the Flocare ENPlus cross spikes on Nutricia feeding sets. Does the OpTri bottle fit on the Infinity Drip Stand? The 500ml OpTri bottle is suitable to be used with the current Infinity Drip Stand. The 1L OpTri bottle will not fit on the current Infinity Drip Stand and we are working on designing a more suitable drip stand. Does the OpTri bottle fit in the Flocare Backpacks? The 500ml OpTri bottle does not fit in the current Flocare Backpack (Child). The 500ml OpTri bottle does fit in the current Flocare Backpack (Adult), however, the 1L OpTri bottle does not. We are currently working on new Flocare Backpack designs for adults and children that will be suitable for use with the OpTri bottle in both 500ml and 1L sizes. Can the OpTri bottle be washed and re-used? We do not recommend washing and/or re-use of the OpTri bottle. Will the number of products per carton change with the OpTri bottle? The 500ml tube feed products will move from 8 to 12 units per carton. The 1L tube feed products will remain at 8 units per carton. Is OpTri more expensive to purchase? No, the price per individual unit will remain the same for both 500ml and 1L OpTri bottle feeds. The carton quantity for all 500ml OpTri bottle feeds will increase from 8 to 12, and so the overall carton price will increase. The information provided above is to be used as a guide only and should not replace the advice of your healthcare professional.